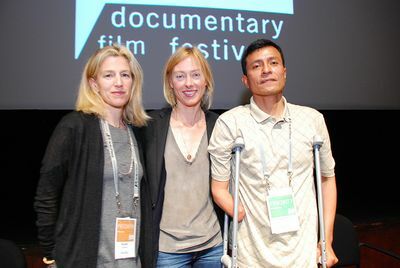 The Full Frame Documentary Film Festival was launched in 1997 as the Double Take Documentary Film Festival, sponsored by the Documentary Studies Program at Duke University. In 2002 the festival parted with the Duke program and adopted its current name. Led for 10 years by founder Nancy Buirski, the event grew, prospered and became internationally known. Buirski stepped aside in 2008 to pursue filmmaking, and the resourceful Peg Palmer provided two years of interim leadership. Deirdre Haj was named director just prior to the 2010 festival. Through 2011 Haj has guided the festival's return to Duke's Documentary Studies Program. "Our missions have never been more aligned," she asserts. "Our borrowing from each other's strengths would create even more benefits for the communities we serve: the documentary community and Durham, North Carolina." In addition to the festival, Full Frame produces year-round, outdoor free screenings at American Tobacco; a Full Frame Fix at the local Nasher Museum; an annual, festival-oriented Teach the Teachers program; and a summer Documentary Production Camp for non-traditional learners. A newcomer would notice a few changes at Full Frame. The four days were, as usual, crammed with documentaries, but Haj tried some streamlining. In the past, panels would be scheduled during screenings. Not so this year. Sponsored by A&E IndieFilms, panel conversations were scheduled in open slots and were held in The Speakeasy, a comfortable space next to the Press Room, where, at the 3:30 pm session, if you were of age, you got a free cocktail! "Reclaiming Fair Use: How to Put the Balance Back in Copyright" and "Honest Truths: Documentary Filmmakers on Ethical Challenges in Their Work." Festival programmers selected four films for the Center Frame showcase, which typically screen works of intrinsic quality and audience appeal. Julie Moggan's feature-length Guilty Pleasures, which opened the festival, was allegedly inspired by the startling statistic that "every four seconds, somewhere in the world, a Harlequin paperback is sold." Moggan focuses on five individuals, women and men, from England, Japan, India and the US, whose lives are changed by their connections to these romance novels. These characters were so ordinary and relatively uninteresting at first impression, but by the end of the film, I was cheering for them to make the changes necessary to bring fulfillment and happiness. Guilty Pleasures was a sort of romance novel in itself. never-before-seen archival footage shot by documentarian Hope Ryden, the film charts the couple's courage and perseverance as two young ACLU lawyers, Bernie Cohen and Philip Hirschkop, agree to take on the case. They eventually argue it all the way to the US Supreme Court. 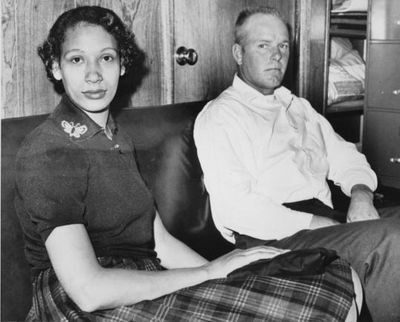 The Lovings' conviction is overturned, and the state of Virginia's anti-interracial marriage legislation is inevitably doomed. HBO co-produced the film, which will air in 2012. Annie Sundberg. The brief ceremony honored their earlier works--In My Corner, The Trials of Darryl Hunt, The Devil Came on Horseback and Joan Rivers: A Piece of Work. One of the filmmakers quipped that her children asked her if this meant she was going to retire! the Q & A that evening. by Göran Hugo Olsson, consisted of Swedish TV journalists' coverage of the Black Power movement in the US--an interesting view of our own culture through another country's perspective. But for me, the session on "Raw Material, Indigestible?" was priceless because it featured Prelinger himself presenting clips from his own Prelinger Archives. What can we learn from a home movie of a Ku Klux Klan rally in a small town in Pennsylvania? How can we judge the filmmaker's motive, if that is important? Should filmmakers use or withhold (as Rick did in his presentation) graphic excerpts they find in archives of electric shock treatment forced on patients in a state mental hospital? The emerging question of archival reuse was centermost in our enlightening class, conducted by a very masterful Professor Prelinger. originally planned just one return to Bamiyan--to show his finished film to the family--Grabsky made several trips to Northern Afghanistan to follow Mir's growth into a young man. 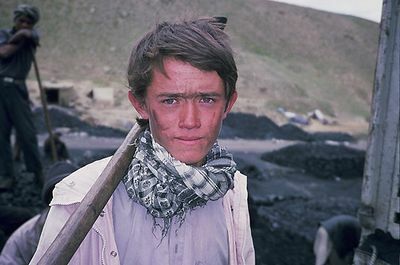 The result is an unforgettable portrait of a boy's, and a country's, development. Scenes of the region's stark beauty contrast sharply with the struggle for survival that the Afghan people face. Penetrating, respectful, absorbing and revelatory, Grabsky's style is both refreshing and responsible. Over the 10-year period, he has established a fund, begun with the proceeds from his films about Mir, to assist in the young man's education and further development. Susan Saladoff begins the film by referencing the celebrated case of the woman who successfully sued McDonald's for millions of dollars when she spilled hot coffee on her lap. I stopped by for ten minutes on the way to another screening to see what in the world a filmmaker would do with such a frivolous law suit. Well, in ten minutes Saladoff had laid out a case that changed my views 180 degrees in terms of what I thought of this case and the important issues linked to it. presenting material evidence to a jury." Two other films in competition caught me by surprise. One was We Still Live Here -Âs Nutayuneân. Directed and produced by Anne Makepeace, it chronicles the story of the Wampanoag Indians, who greeted the Pilgrims in 1620, and subsequently lost their language--which they have now painstakingly regained, thanks to the amazing efforts of Jesse Littledoe Bair, through her use of historic contracts, old deeds and footnotes in native Bibles. A very moving film, it won the Full Frame Inspiration Award. 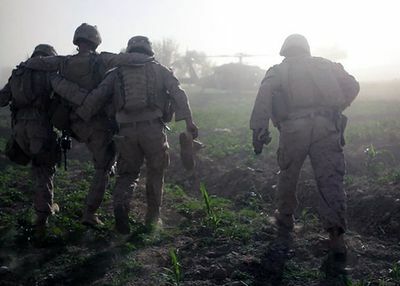 Sergeant Nathan Harris is wounded. The image and sound in the film switches brilliantly back and forth from the turmoil of war to Nathan's physical and emotional turmoil as he attempts, with the tender and patient care of his young wife, to come back from three tours of duty and his serious injuries. In addition to the Center Frame films and the thematic program, the festival invited some 16 films, one of which was Barbara Kopple's Gun Fight, which affirms her stunning record of making timely and important films about controversial subjects. It features some interesting characters: Colin Goddard, survivor of eight bullet wounds in the 2007 shootings at Virginia Tech, who stumps tirelessly for sensible gun legislation; and Garen Wintermute, ER physician from UC Davis Medical Center, who pleads in Sacramento for help in closing the "gun-show loophole," which allows almost anyone with the money to buy all manner of weapons, including assault rifles, from "private owners" at gun shows. Another compelling figure in the film is Richard Feldman, who for 20 years was head of PR and legislative activities for the National Rifle Association, but became disillusioned by the politics of it all. He now tries to hold a centrist position in calling for sensible gun regulation. Hearing all these folks speak in person after the film was quite moving and informative. where they use skills and insights gained from their own complicated and violent past lives to help those involved to a solution that eschews violent retaliation. The other Kartemquin film was the world premiere of A Good Man, a film about the incomparable dancer/choreographer, Bill T. Jones. It chronicles his struggle, both aesthetically and emotionally, to produce a commissioned contemporary dance concert honoring Abraham Lincoln. Quinn and Bob Hercules capture both the man and the process in this absorbing and informative work. of festival winners and other information about the event, click here.